The dynamic between cartoon characters Tom and Jerry might be an apt comparison to the relationship between Kyo Sohma and Yuki ... literally in the sense of their cursed forms and also in how Tom (the cat) always seems to get the short end of the stick and Jerry (the mouse) always outwits him. At first glance, that might seem like what Yuki and Kyo are like, and certainly what Kyo thinks of it, but upon looking in deeper, is that really the way they are? Must they really act like cat and mouse? 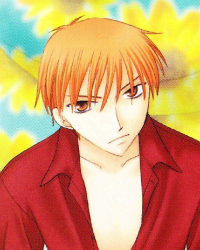 Kyo is the one end of the Fruits Basket balance, with Yuki on the other end. The two of them are iconic characters and we wouldn't have the series with only one of them. But whenever I discuss this series with others, one of the first questions I'll ask is if they prefer Yuki or Kyo. (The right answer is Yuki.) But I digress. A big part of the series is the continuous struggle between the two, with Kyo desperate to be accepted as part of the zodiac members and blaming Yuki for being the rat. Both are great characters with outstanding qualities, and their dichotomy is what makes the series so great. In fact, even their attire was planned to separate them - if you'll notice, Kyo always wears his shirts with open collars whereas Yuki always does his buttons up all the way, especially noted in their school uniforms, where Yuki always wears a tie and Kyo bares some chest. Yuki also tends to dress in Chinese-style clothing sometimes because the mangaka likes such attire, and Kyo has a decidedly more Western flair to his wear. Castles In Air is a fanwork © Chrissy 2012 - 2016. No infringement intended.